(Nanowerk News) A UT Arlington bioengineering researcher has teamed with a UT Southwestern colleague to develop a nanoparticle drug delivery system that will help stimulate lung growth and function after partial lung removal or destructive lung disease. Kytai Nguyen, an associate professor of bioengineering, is working on the drug-delivery portion of the project, which is funded through a $3.4 million National Institutes of Health grant through 2016. Nguyen's work will be underwritten by $440,000 of the larger grant. 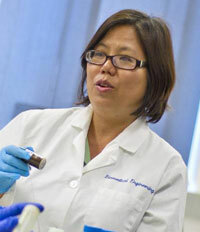 Kytai Nguyen "We will introduce drugs through inhaled nanoparticles that will stimulate lung growth and remodeling following partial lung removal," said Nguyen, who joined UT Arlington's College of Engineering in 2005 and holds a joint appointment with UT Southwestern Medical Center of Dallas. "We will synthesize biocompatible, biodegradable polymers that will encapsulate, or load, and release the drugs where needed." The polymer used to house the drugs will degrade with time, allowing the drugs to be released within the lung. Various polymers can be used to control this drug-release time. Magnetic or fluorescent labels may be incorporated into the nanoparticles as tracers initially, but omitted in final therapeutic formulations. Connie Hsia, a professor of Internal Medicine at UT Southwestern will direct the overall project. She said that once the drugs are delivered via nanoparticles, the research team would be able to measure therapeutic response using non-invasive imaging, physiological testing, and detailed structural analysis. "This research is important because currently there is no definitive cure for most destructive lung diseases except transplantation," Hsia said. "We have shown that partial lung removal may trigger regrowth of the remaining lung to compensate for the loss. Using nanoparticle as a vehicle for delivery of therapeutic compounds, we hope to amplify the lung's innate potential for regrowth." Nguyen and Hsia hope their work will lead to better quality of life for people who have had a part of their lungs removed by surgery or destroyed by disease. Nguyen has studied how physical and biological factors influence the proliferation of vascular smooth muscle cells, a condition that can lead to heart disease. She also has conducted research using focused laser beams called optical tweezers in nanoparticle-cell manipulation with Samarendara Mohanty, a UT Arlington associate physics professor. Nguyen's work is representative of the research under way at The University of Texas at Arlington, a comprehensive undergraduate and graduate institution of nearly 33,000 students in the heart of North Texas. Visit www.uta.edu to learn more.